Brooklyn Digest: St. John's Shutdown In D.C.
Shamorie Ponds had a big game for St. John's. @StJohnsBball. 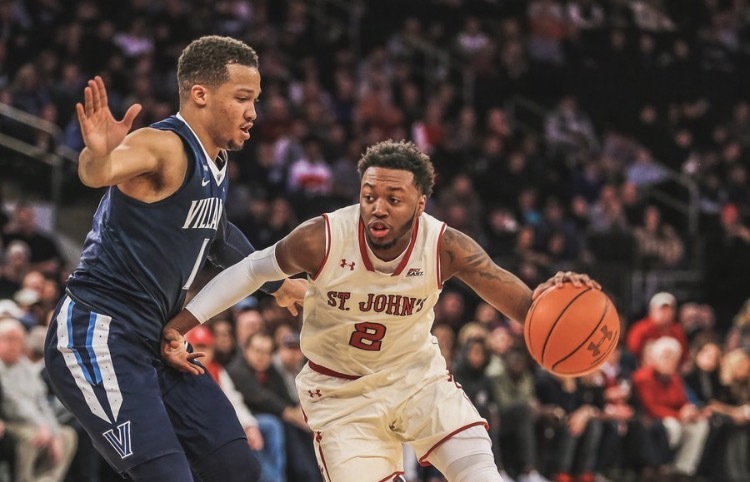 St. John's suffered their second tough loss to Georgetown in eleven days, this one in double overtime, 93-89, on Saturday afternoon in Washington, D.C.
St. John's is now 0-8 in Big East play, and their record overall is now 10-10. They have gone a month without winning a game, since they beat St. Joe's at Mohegan Sun on December 20. It doesn't get any easier for the Red Storm as they host Creighton on Tuesday night at 8:30 at Carnesecca Arena. Shamorie Ponds had another big night, his second 30-point effort in the last three games, as he 33 points on 12-23 from the field and 3-7 from behind the arc, to go along with eight assists, six rebounds and three steals. Tariq Owens netted 17 points on 8-of-14 shooting, and had three blocks to add to his Big East-leading total, and also had seven rebounds. Marvin Clark II tallied 15 points (4-10 FG, 3-8 three-pointers) and four rebounds. Bashir Ahmed had 11 points (4-11 FG, 2-6 threes) and six rebounds. Georgetown was led by Marcus Derrickson, who had 27 points on 9-23 from the field, 1-6 on three-pointers, and 8-12 from the free throw line, with 11 rebounds and two assists. Jamorko Pickett (5-9 FG, 4-6 threes) and Jessie Govan (5-14 FG) had 16 points apiece, with Pickett notching nine rebounds and four assists, and Govan had eight rebounds and an assist. Just as it was when the teams met at Madison Square Garden on January 9, this one was even from he start, with the score tied at 15 with eight minutes remaining in the first half. At that time, St. John's went on a 9-2 run, climbing ahead by seven, 24-17, three minutes later. Marvin Clark II connected on a pair of threes to pace the Red Storm during the tear. The Hoyas quickly responded with seven unanswered of their own, knotting the contest at 24 at the 3:54 mark of the first. Following a Ponds layup, Jonathan Mulmore knocked down a three for the Hoyas, giving them a 27-26 lead, its first in nearly eight minutes. St. John's rallied to take a 30-29 at halftime, and started the second half with a 6-0 spurt to move ahead by five, 35-30. After Georgetown responded with a 7-0 run, the Red Storm scored eight in a row and then followed with an 11-2 run, moving ahead by seven, 46-39, on a Ponds three from the corner with 13:30 to play. Owens scored the first six points on the run, converting on a pair of tough layups inside before draining a baseline jumper. Leading by five, 54-49, with just over nine minutes to go in the game, St. John’s saw Georgetown unleash an 8-2 run, reclaiming the lead, 57-56, less than four minutes later. After trailing by as many as five, 63-58, the Red Storm tied the game at 65 on a 3-pointer from Clark with 1:52 remaining, capping a 7-2 run for the Johnnies. Ponds scored the other four points for the Red Storm during that stretch. Following three free throws from Blair, the Johnnies stared down a three-point deficit, 68-65, with 1:33 remaining. After an empty possession and a stop on the defensive end, the Red Storm earned two points the hard way, grabbing two offensive boards before Ahmed buried one home to pull within one, 68-67, with 28 seconds to go. After Jessie Govan went 1-of-2 from the stripe, Ponds drove to the basket and sent a home an acrobatic layup through traffic, knotting the contest at 69. The Hoyas had another shot to win in regulation, but the Johnnies came up with the stop and the game went to overtime. The Red Storm appeared to have victory in their handds toward the end of the first overtime, but let a five-point lead slip away in the final 24 seconds. Marcus Derrickson closed the frame on a personal 6-1 run, including a clutch three with just three seconds on the clock and knotting the contest at 79. Georgetown controlled the second overtime from the start, scoring the first six points of the period, including a four-point play from Jagan Mosley.